Unique furniture designs include red cedar (and some holly) chairs, stools, ottomans, and tables handcrafted from recycled wood. 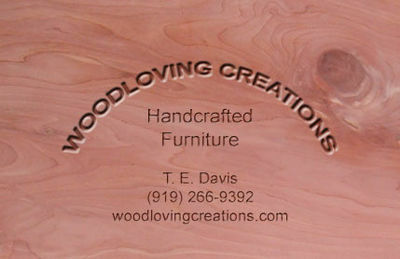 Tom Davis is the designer and builder for each creation. Designs are created to be comfortable and functional, with an appeal that is both rustic and artistic. They are beautiful to see, and practical to use. Each piece has been wood burned with the stamp of the artist, and a written description of the work process is provided with each piece. While Tom is never short on his own ideas for new creations, he is willing and open to discussion of new designs suggested by his customers. You are encouraged to contact him at Woodloving Creations to create what may become an heirloom piece of furniture for your home. Tom likes to talk to each client before a special order is placed to better understand the customer’s wishes, and to discuss honestly what it is possible to create from available materials. Each piece of furniture by Woodloving Creations is a unique, one of a kind item created with patience and care from pieces of cedar (and some holly). Each limb or root has its own natural shape and beauty that is highlighted by the finishing process. Each piece will grace your home with its own naturally polished design. The wood is finished until it is satin smooth. Seats for cushioned chairs are hand upholstered with pigskin or deer hide. This website is maintained in Tyler Uebele's free time.